Santa is flying into New Canaan on Saturday! 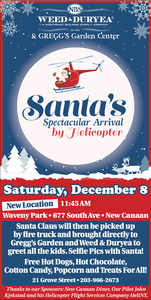 Don't miss Santa's Spectacular Arrival by Helicopter on Saturday, December 8 in Waveny Park! Santa will arrive at 11:45 AM to 677 South Avenue, Waveny Park New Canaan. Santa will then be picked up by a Fire truck and brought to Weed & Duryea and Gregg’s Garden Center, 21 Grove Street, New Canaan to greet all the kids,! Santa will offer Selfie pics with kids! The event will feature free hot dogs, hot cocoa, cotton candy, popcorn and treats for all! Visit New Canaan Chamber online here to learn more.